To shutdown Windows 8 for a new Windows 8 user is confusing. With new Windows metro-style design Windows desktop is replaced with Windows 8 Start screen. 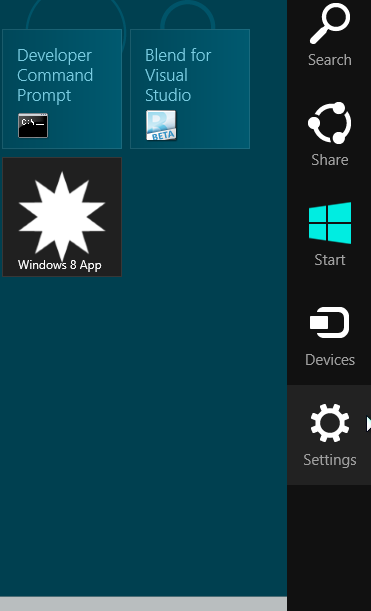 Start button is also removed in Windows 8. So if they are not familiar with Windows Settings Charm, to shutdown Windows 8 is a common question for new Windows 8 users. The reason behind removing the Shutdown button away from view is that there is now no need to shut down Windows 8 PC or Windows RT tablet. 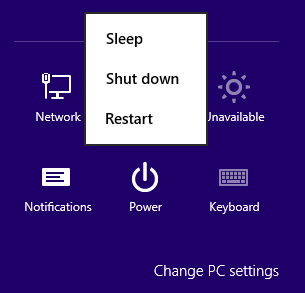 You can keep your Windows 8 operating system running device in sleep mode instead of shutting it down. Your computer will start-up very fast and additionally the power consume will be very low in sleep mode. But you can still shutdown Windows 8 using the below described method easily. If you are looking for a more direct method to close Windows 8, you can also try Windows 8 shutdown shortcut Alt+F4 key combination. Shutdown Windows 8 and close all apps running on Windows 8 OS using the Settings Charm is a 3-step process. First of all either you are on Windows 8 Start screen or on Desktop mode screen, move your mouse to the bottom right corner of the Windows 8 screen. A dynamic menu will appear on the right side of the screen. These controls are new with Windows 8 and they are called charms. Click on the Settings icon to display Settings charm. You will see Power icon on the Windows 8 Settings charm. When you click on the Power icon, a context menu will be displayed. You will see Sleep, Shut down and Restart menu commands. When you click Shut down in the Power context menu, Windows 8 will close all apps and turn off the PC. Is it confusing? I guess you will get use to shut down Windows 8, new Windows OS on your PC by using the new Windows 8 Settings charm Power button.